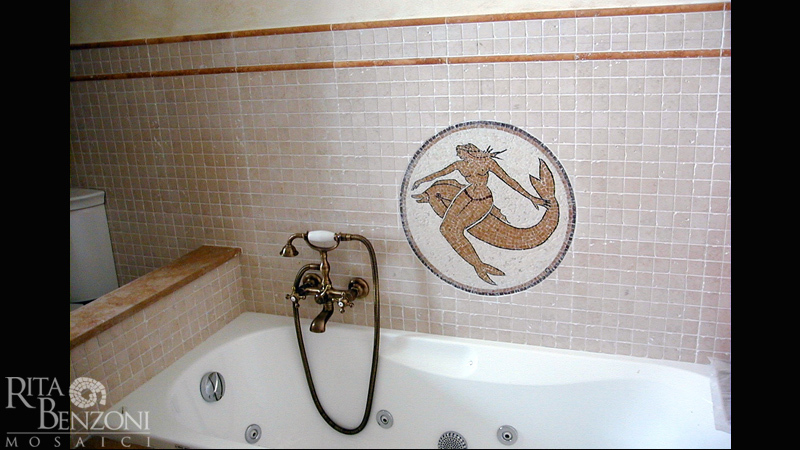 Bathroom marble and gold mosaic. 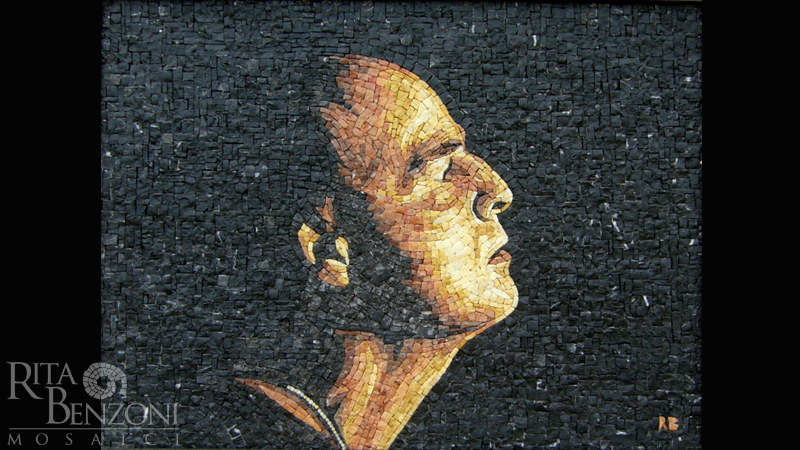 Marlon Brando plays the Colonel Kurtz in Apocalypse Now directed by Francis Ford Coppola. 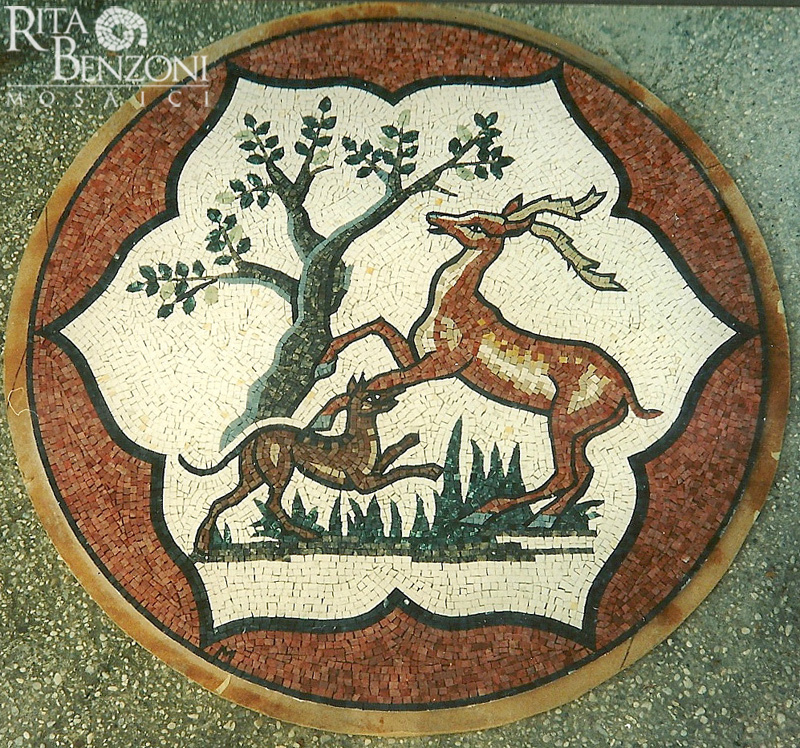 Mosaic made of marble tesseras. 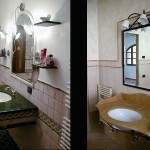 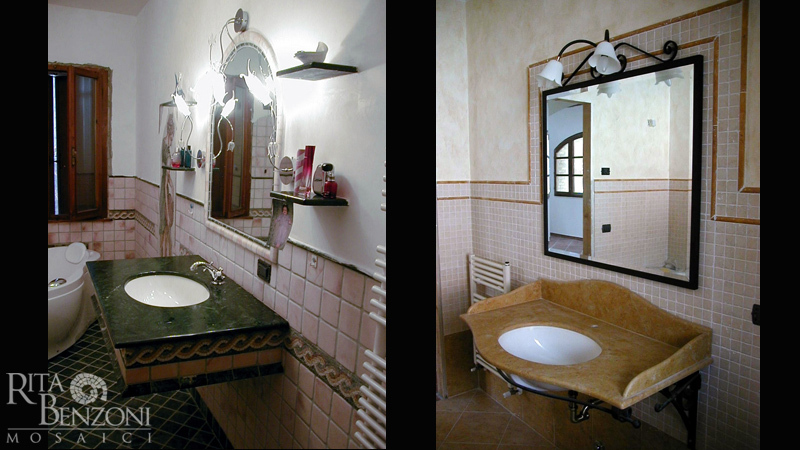 Wall tiles bathroom made of Nero Marquinia and Rosa Portogallo marble layed using a mirroring effect. 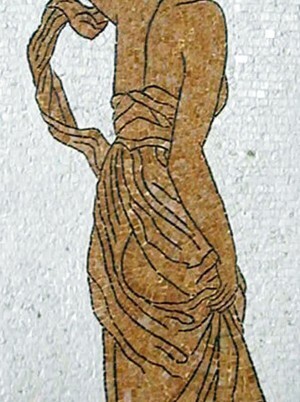 Greek style mosaic borders made whith minute tesseras using roman technique. 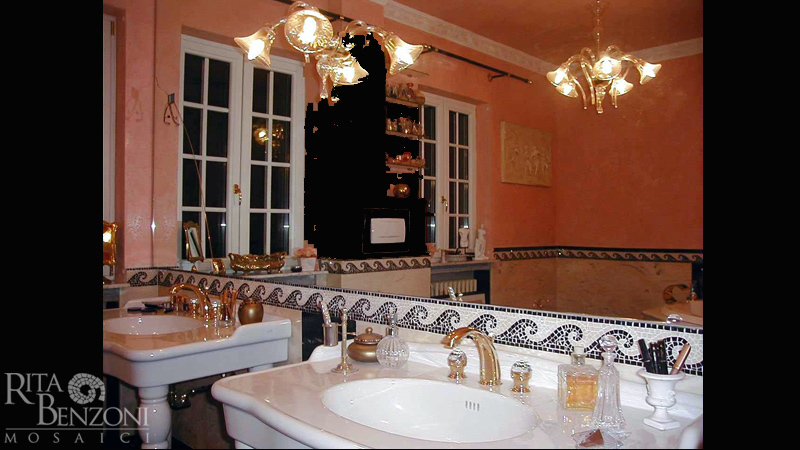 Marquinia Black and Carrara White marble tesseras. 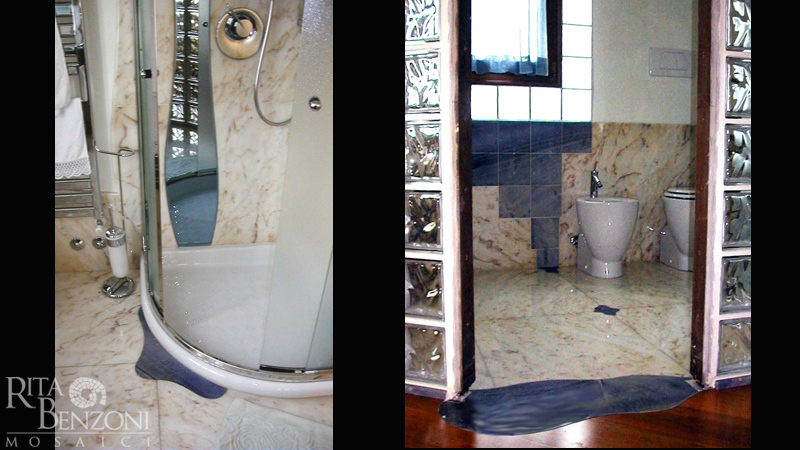 Wall tiles bathroom made of Nero Marquinia and Rosa Portogallo marble layed using a mirroring effect. 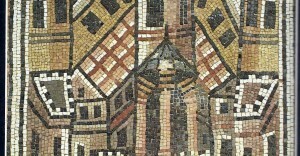 Greek style mosaic borders using roman technique. 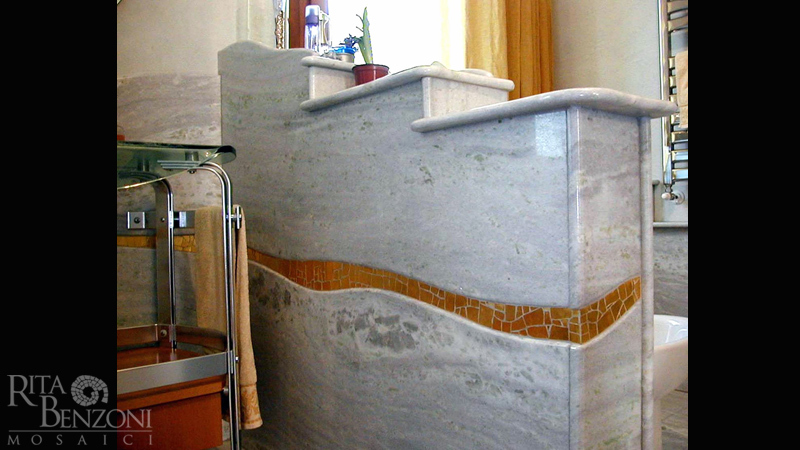 Marquinia Black and Carrara White marble tesseras. 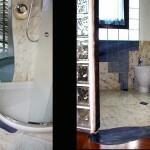 Wall tiles bathroom made of polished Azul Sky marble whith decorative detalil made of irregular gold tesseras. 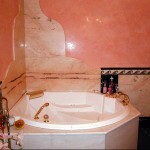 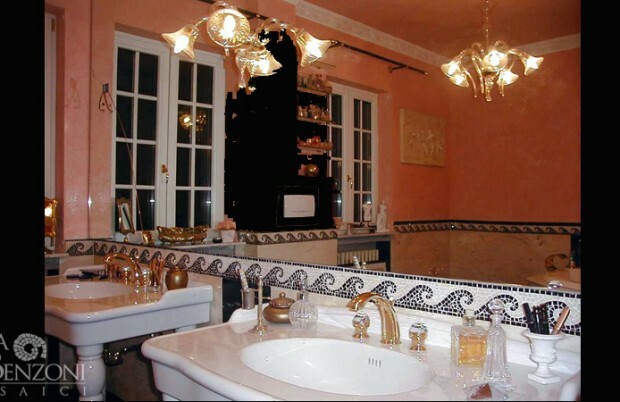 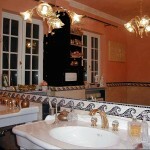 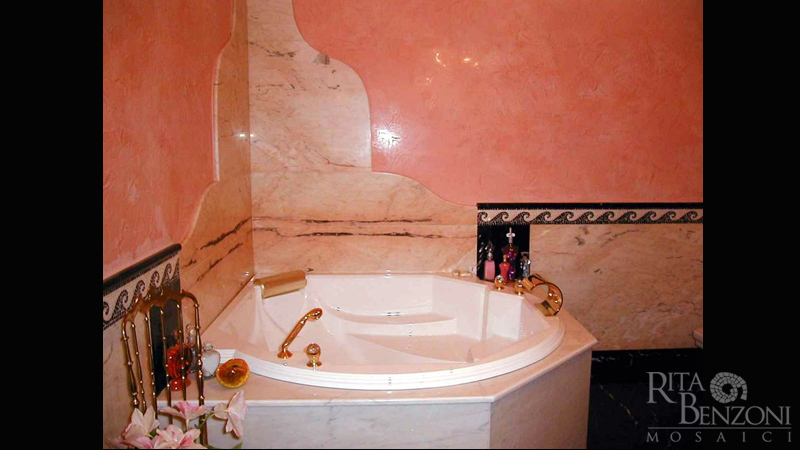 Bathroom floor and walls made of polished Portogallo Pink marble. 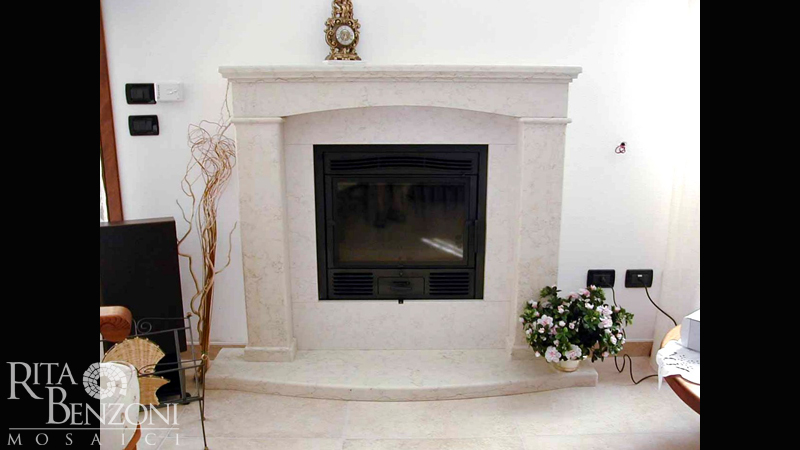 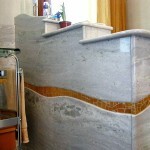 Decorative details made of Azul Macaubas marble. 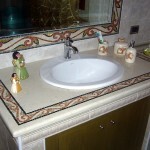 Washbasin and wall tiles bathroom made of aged marble with mosaic decoration. 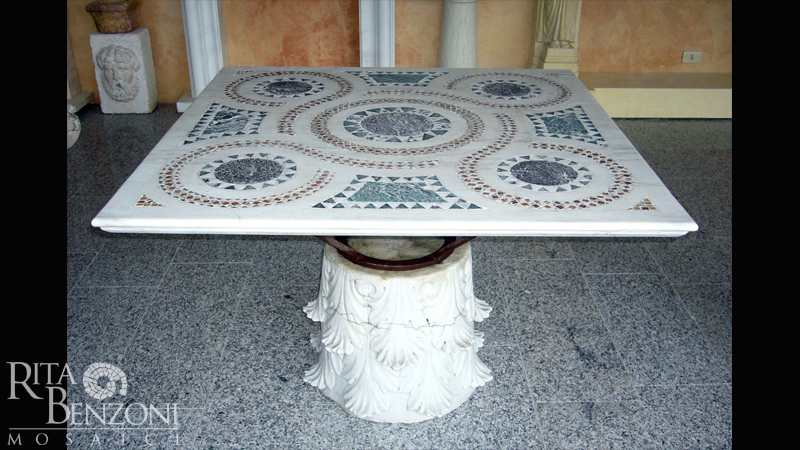 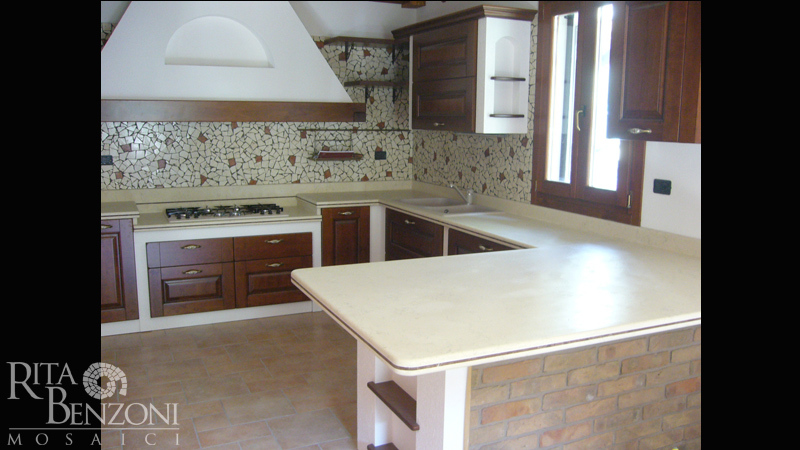 Asiago White marble top inlaid with a mosaic. 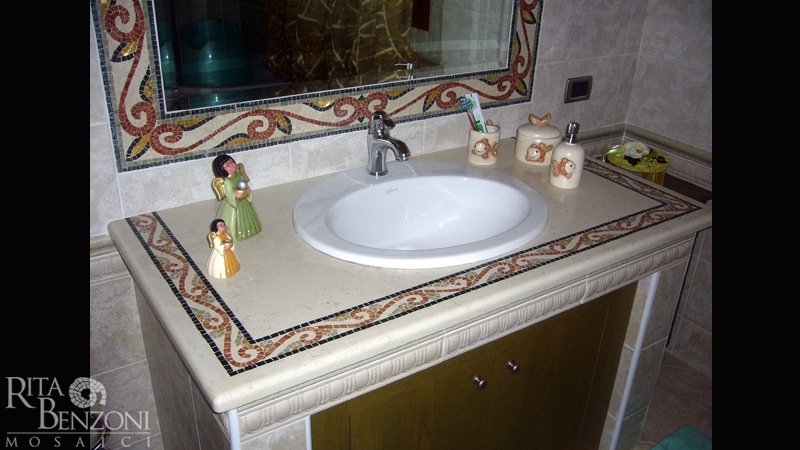 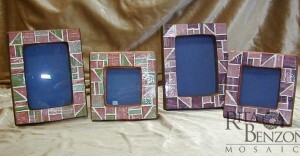 Even the wall mirror frame is made with mosaic marble tesseras. 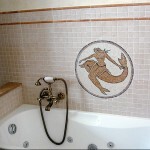 Wall tiles bathroom made with aged big tesseras mosic. 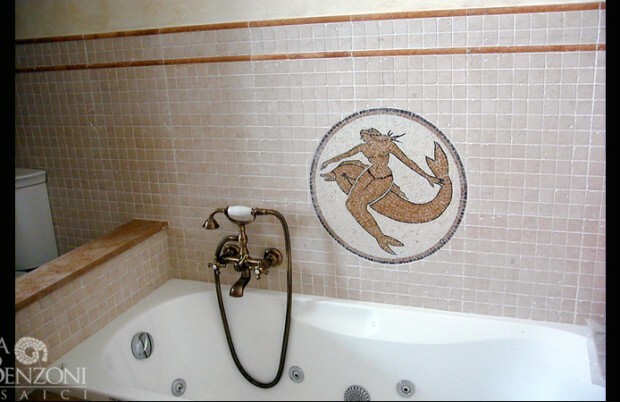 Mermaid on a dolphin mosaici s made with little aged marble tesseras. 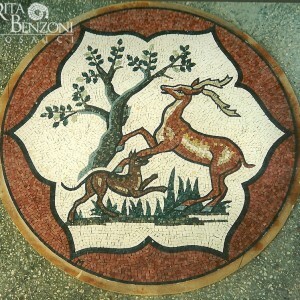 Veneto school of mosaic art. 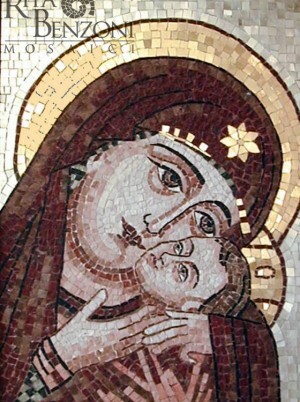 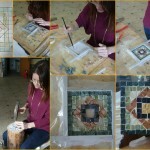 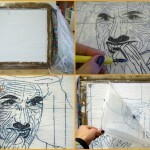 The basic program includes learning the mosaic art technique indirectly by making a small mosaic with simple design. We will start with some theoretical notions, then the design, we will cut the materials and make the mosaic with marble or glass tesserae. 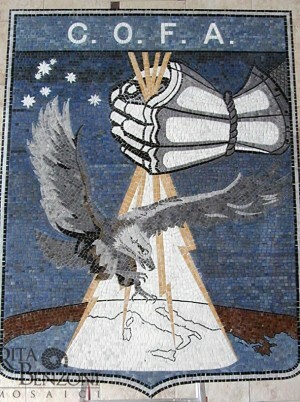 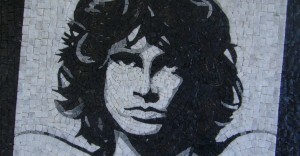 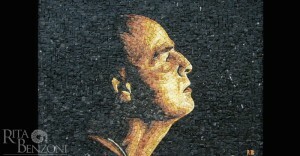 The mosaic created by the students will remain in their possession. 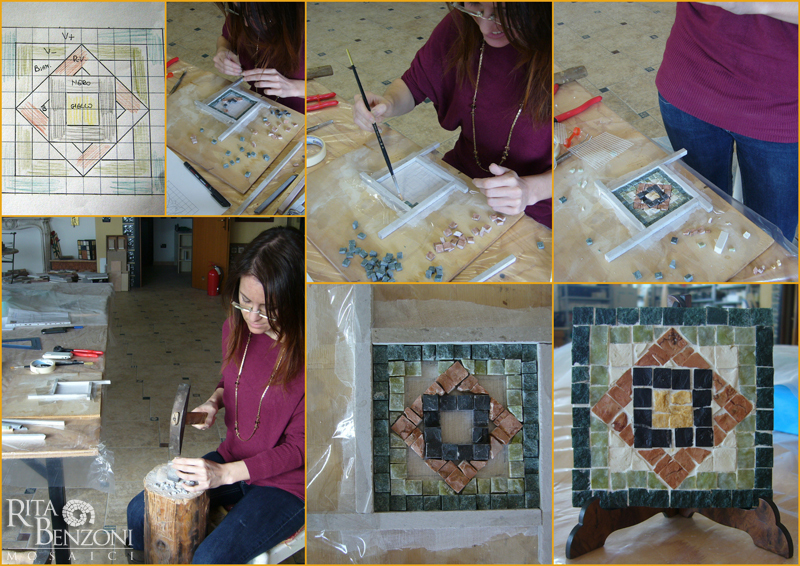 For those wanting to deepen their learning, we will be able to make mosaics with a more complex design. 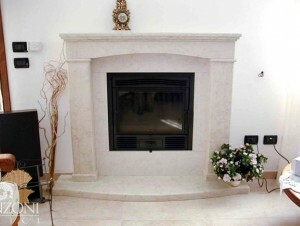 The more advanced levels provide learning the technique of slaked lime and the technique used on different surfaces. 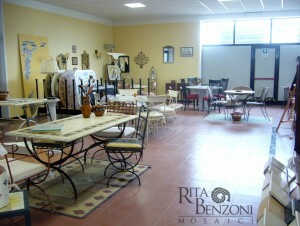 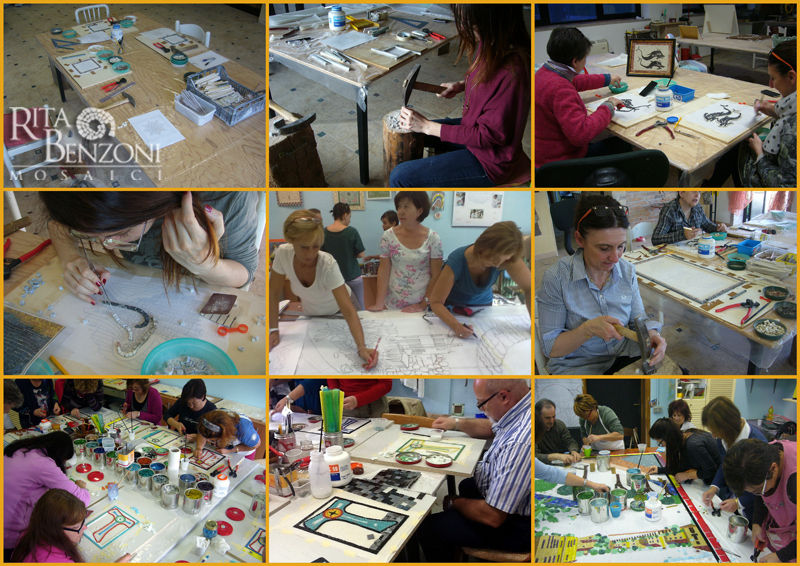 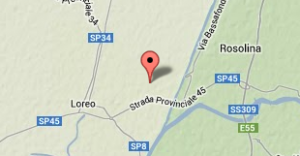 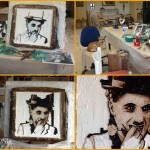 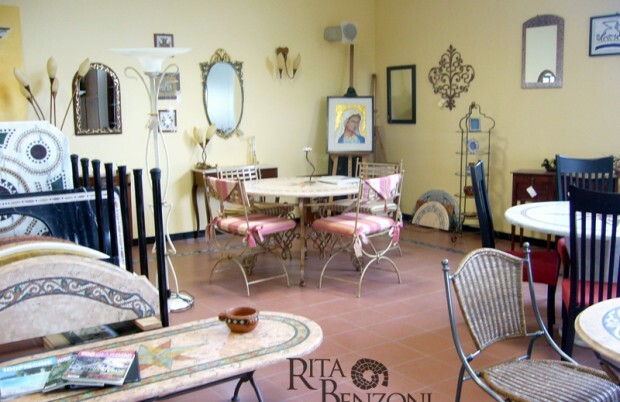 The course takes place at my workshop in Loreo (Rovigo), with classes lasting between two to three hours. 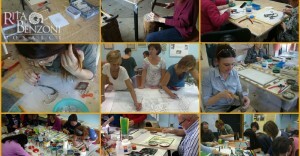 Training projects for groups can take place at the applicants’ headquarters Lessons can be individual or for groups. 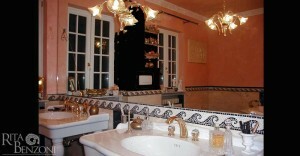 Please contact me via email at any time should you require any further information. 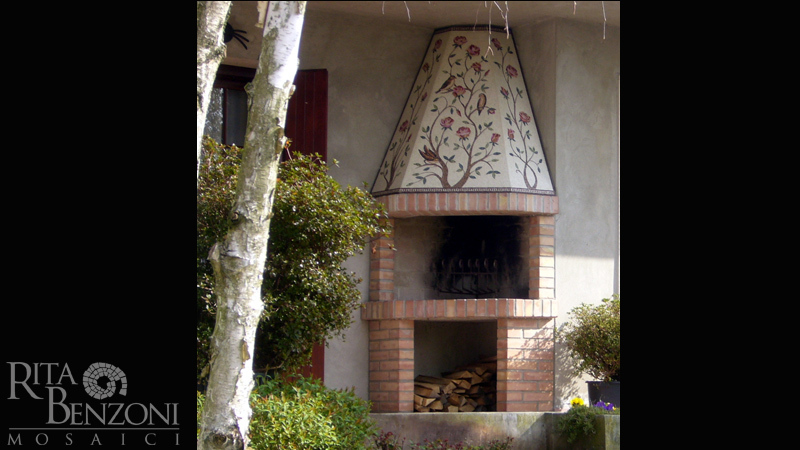 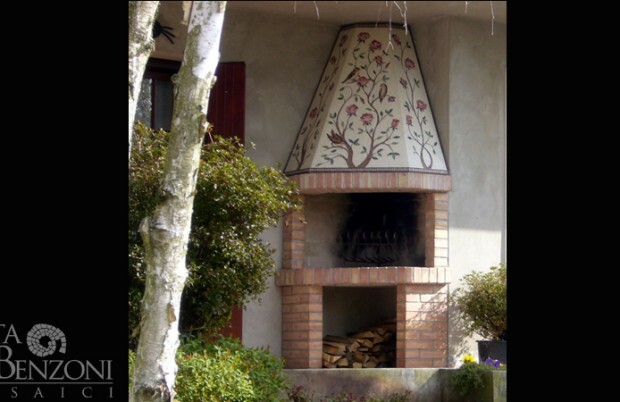 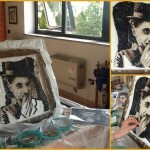 Elena, architect from Rovigo, wants to learn the mosaic technique. 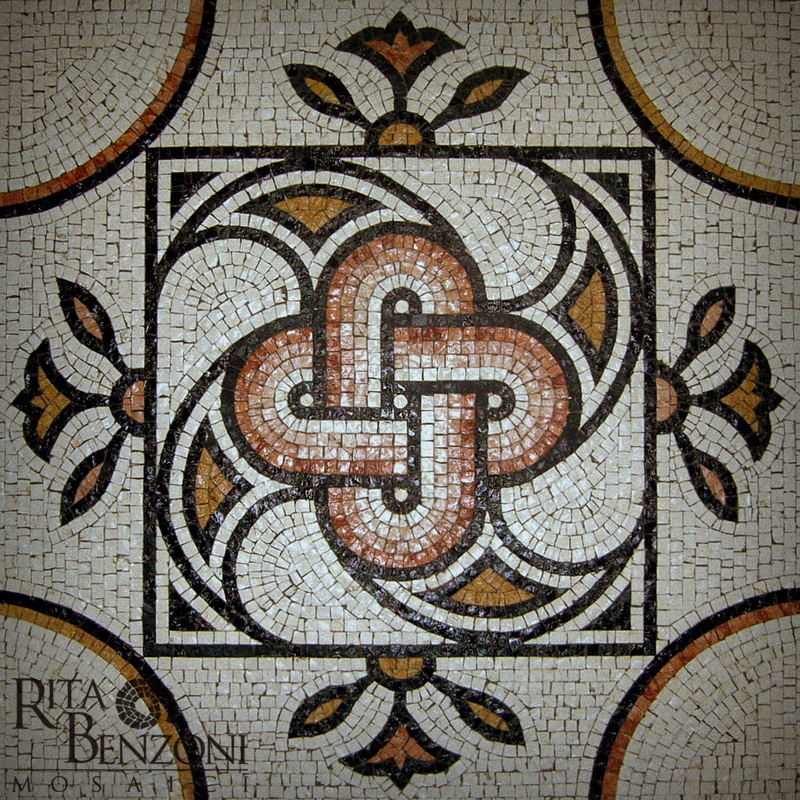 We decide together a little tile to do in a few hours. 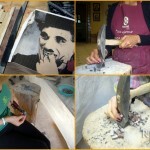 These are a few moments of is work. 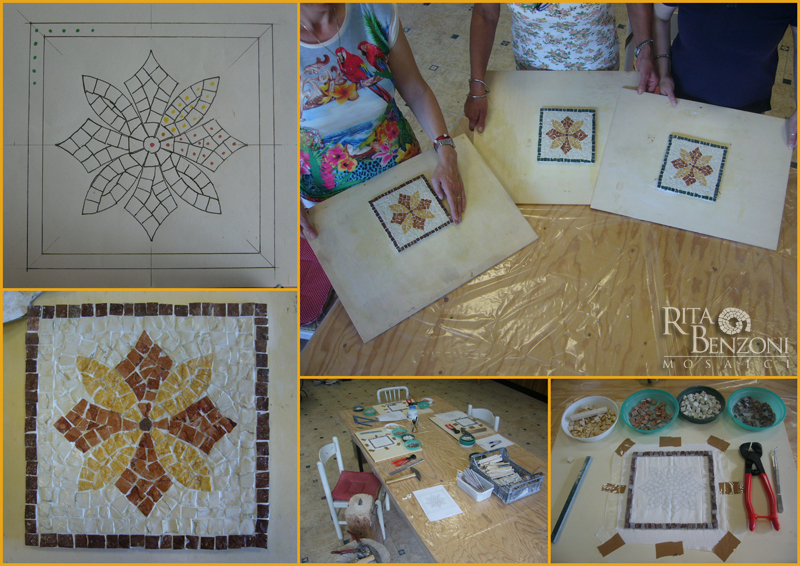 My very respectable students made, with marble tesseras, a tile depicting flower Byzantin. 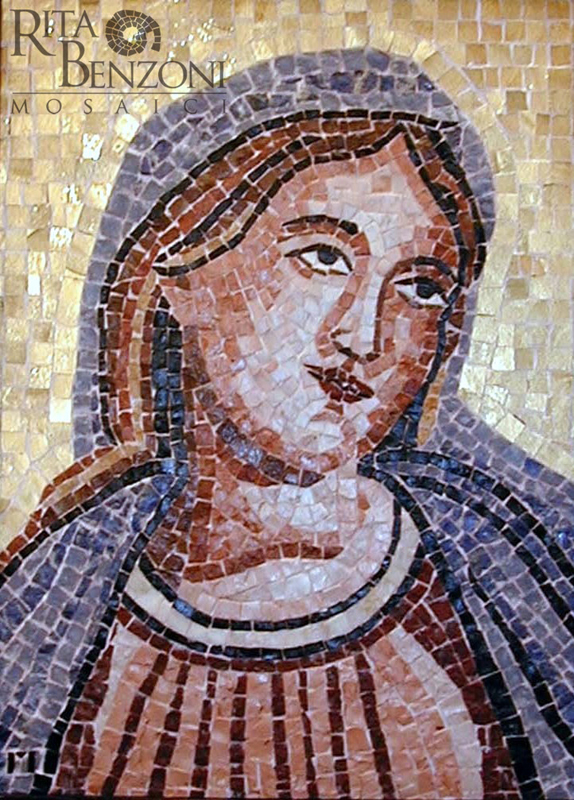 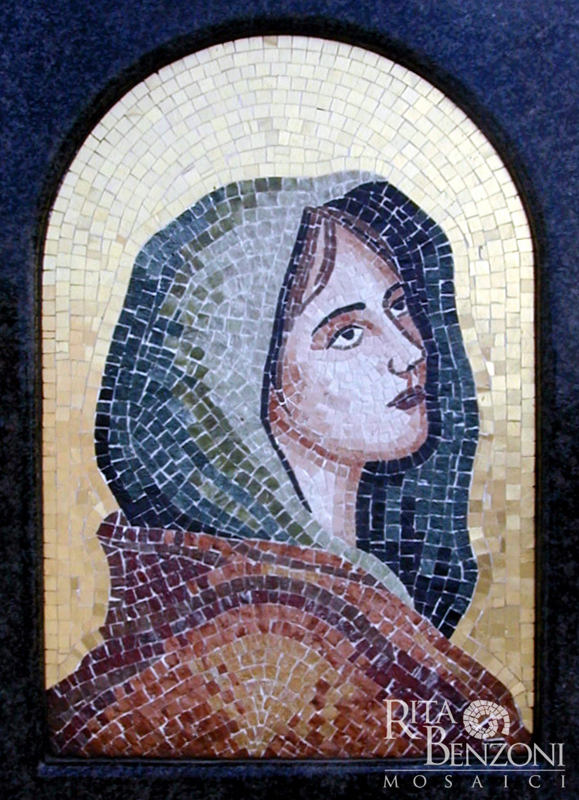 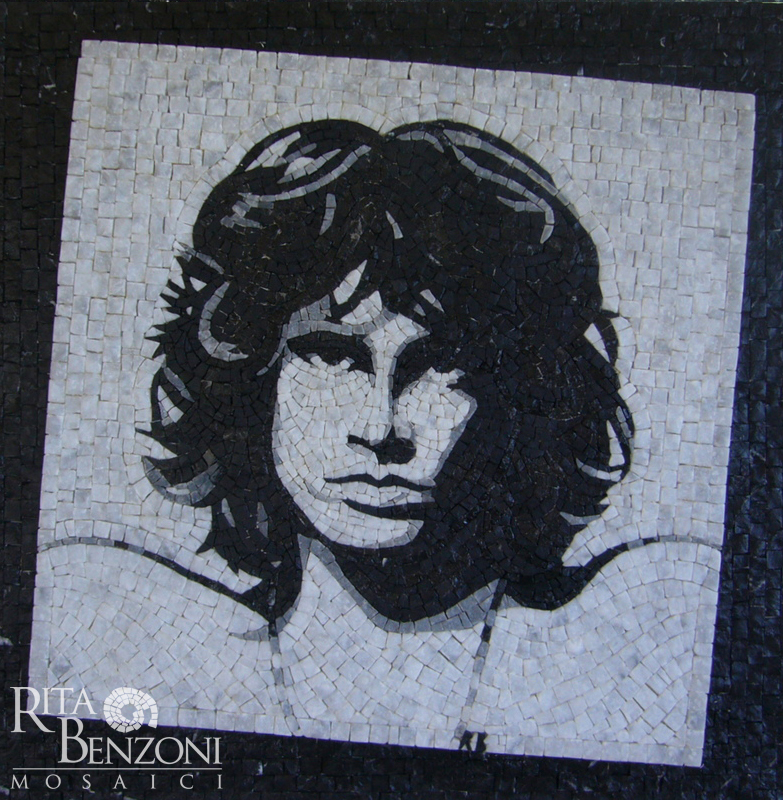 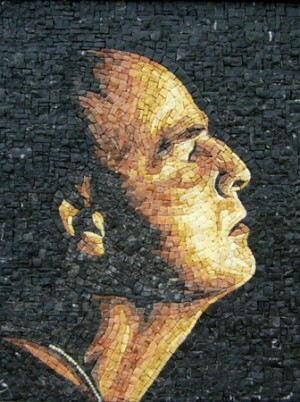 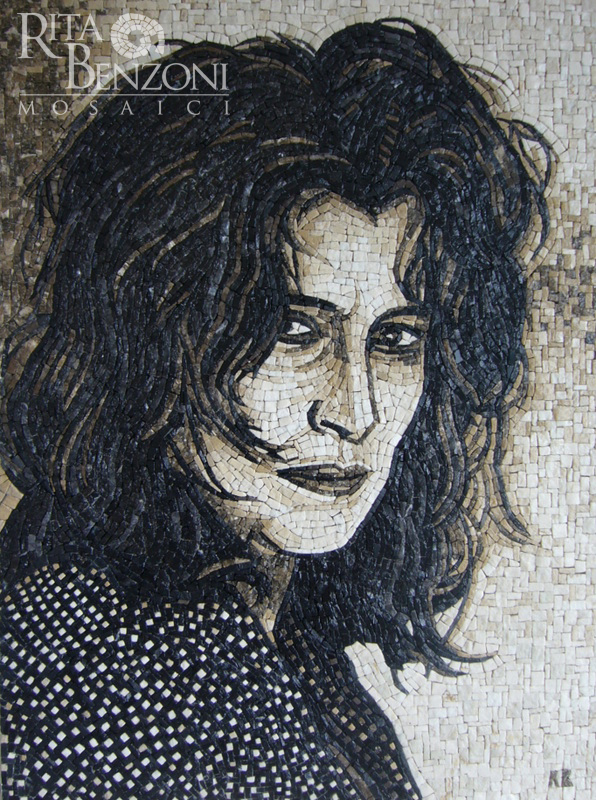 Mosaic portrait made with marble tesseras. 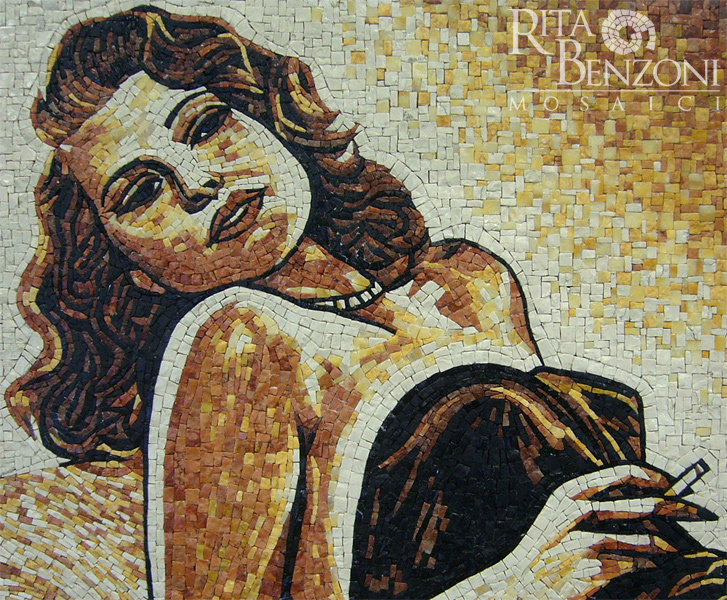 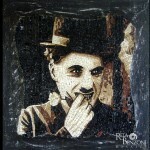 Rita Hayworth Portrait Artistic moasic made with marble tesseras. 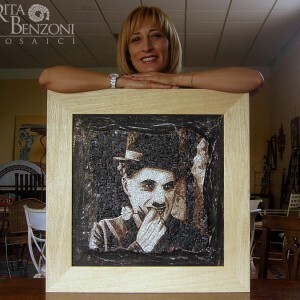 Artistic moasic made with marble tesseras. 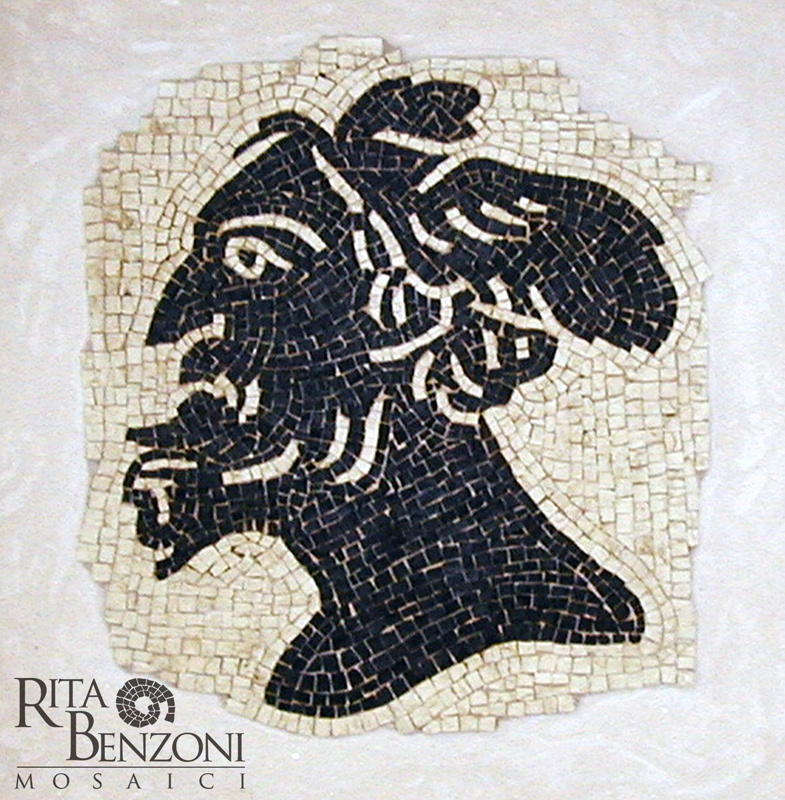 Artistic mosaic made with Asiago White, Marquinia Black and Bardiglio Gray marble tesseras. 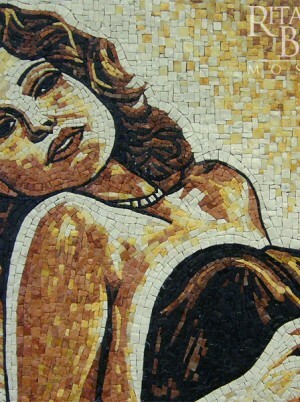 Step by step the work in progress of a mosaic. 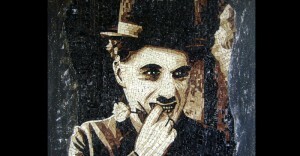 - City lights – By Charlie Chaplin, 1931… The last scene of the movie. 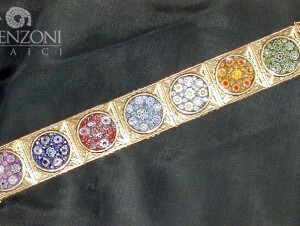 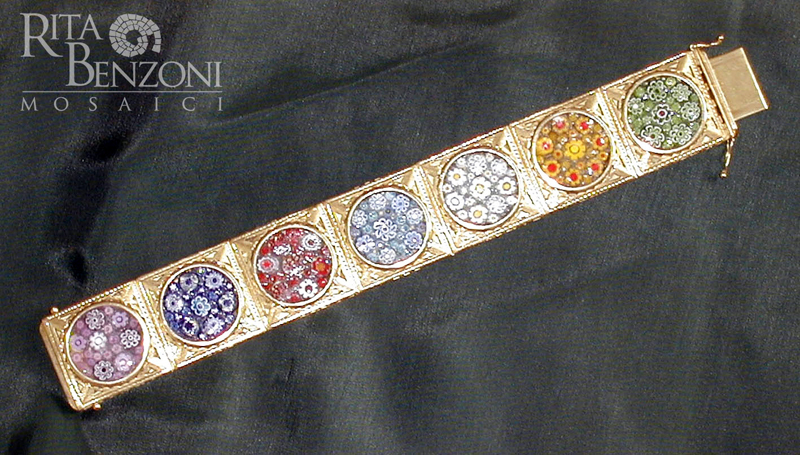 I make the draft on silverplated pergamino… Yes, because we don’t settle mosaicists of any tissue, we just want this! 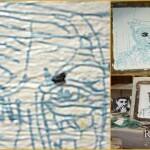 There is always a great feeling of loss when you find yourself in front of white space to be filled. 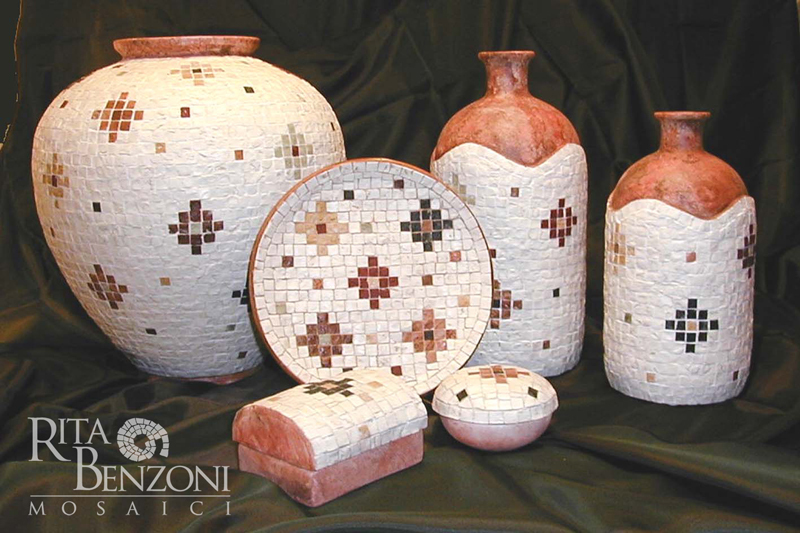 It’s always the same thing: the blank sheet of paper for the writer, the clean canvas for the painter…the fresch lime to the mosaicist. 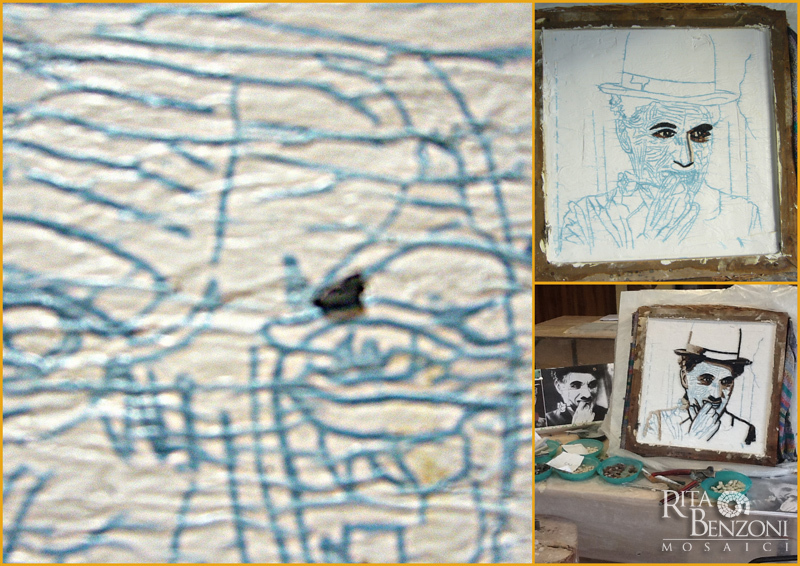 I tracing the footsteps of drawing with pen and ink, then I print it directly on slave lime. 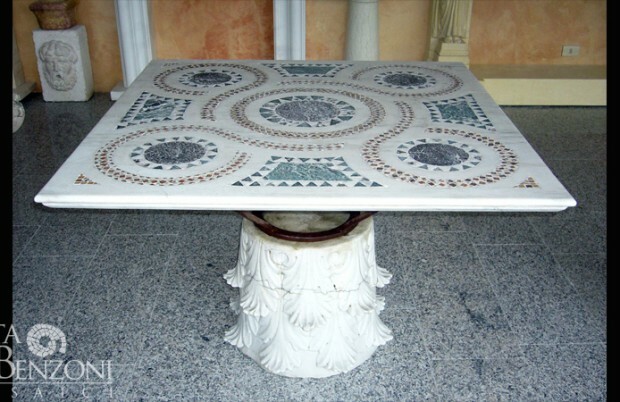 With a pin I hole the design to eliminate air bubbles formed between the pergamino and the lime: their presence could compromise a good drawing print. 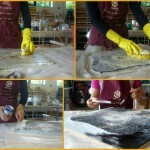 Gently I remove the tissue from lime. 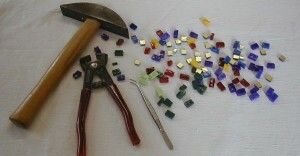 This is my color palette. The marble that I’ll use will be: Asiago White, Marquinia Black, Trani light and dark. 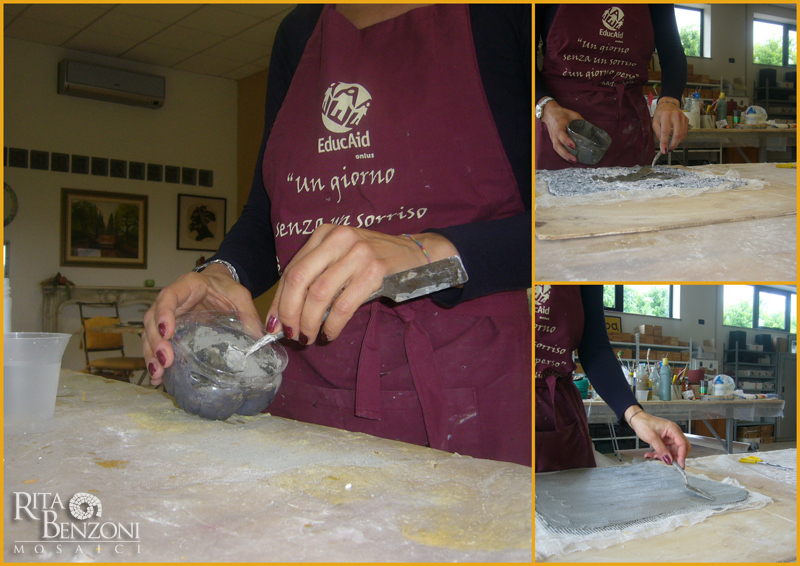 With the hammer and the leghold trap I beginning cut the marble stick to more and more small pieces. 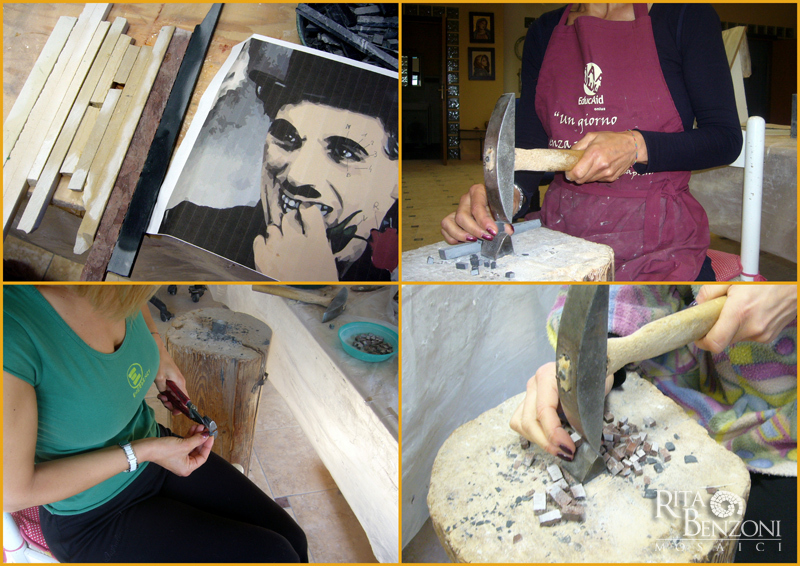 An important working tool are tongs. 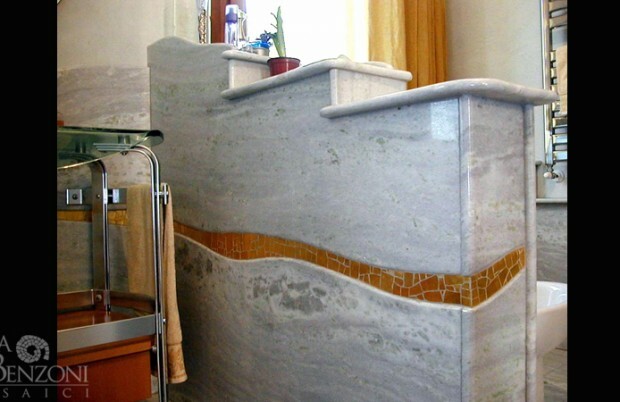 They’re used to cut and shape in more precise ways the marble tesseras. 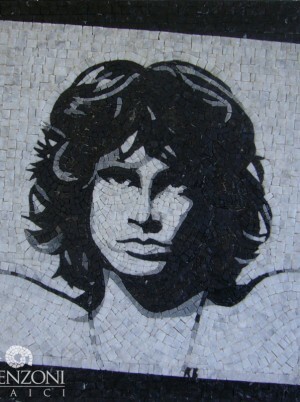 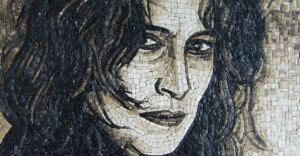 The eyes are the most challenging and difficult to make and then it is from here that beginning the mosaic. 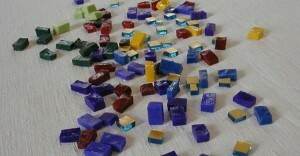 Tessera by tessera, I’ll continue with the main lines of the drawing. 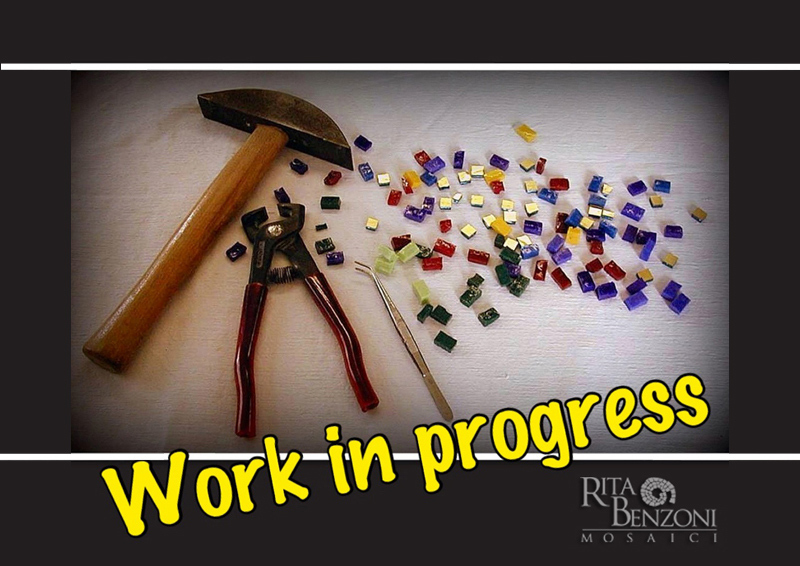 At this stage, the processi s very slow and it takes a loto f patience. 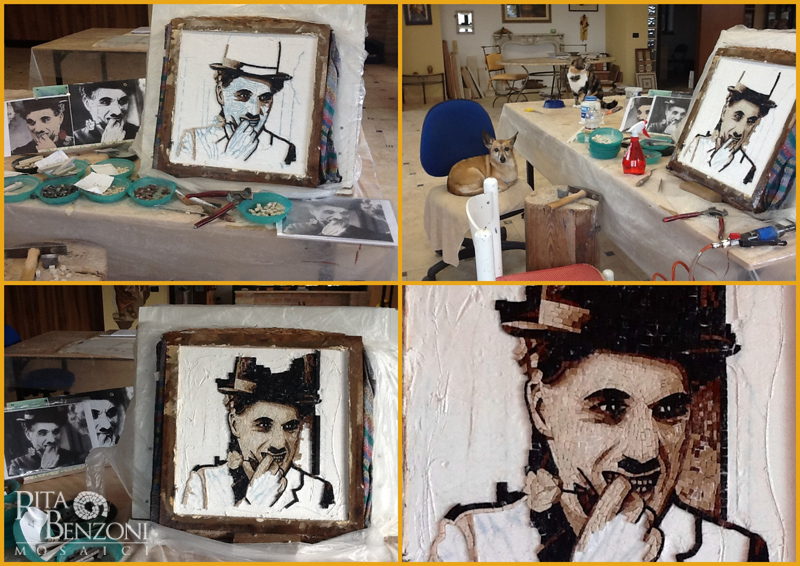 Me company Perlina the dog and Biky the cat. 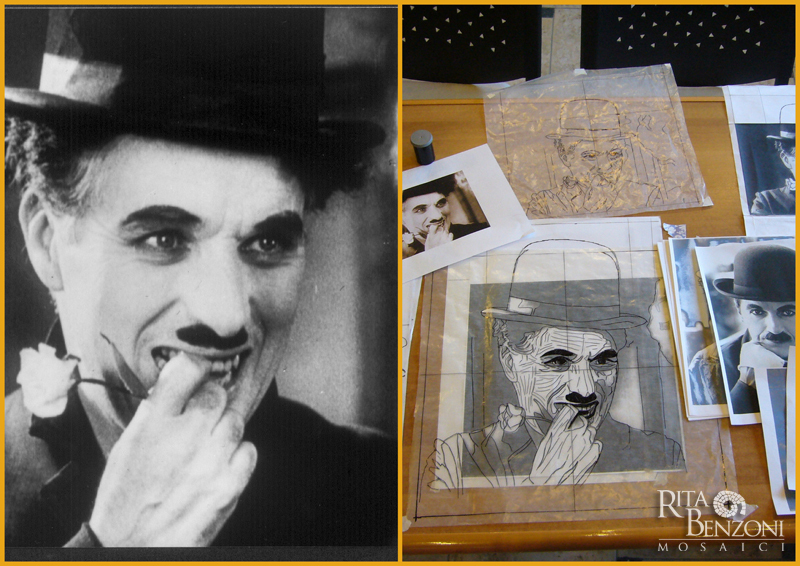 I finished the face, now I’ll proceed with the other parts of work..
Day by day Charlie takes increasingly form. 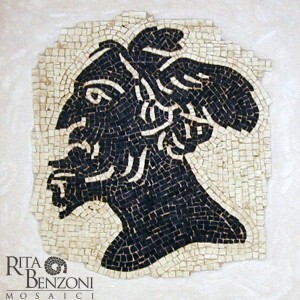 Sometimes I get the impression that he talk to me…he enters in my mind, in my thought.the tesseras. 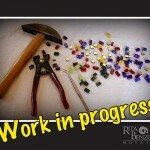 This allows me to workwith them for as long as necessary doing all the fixes that I want. 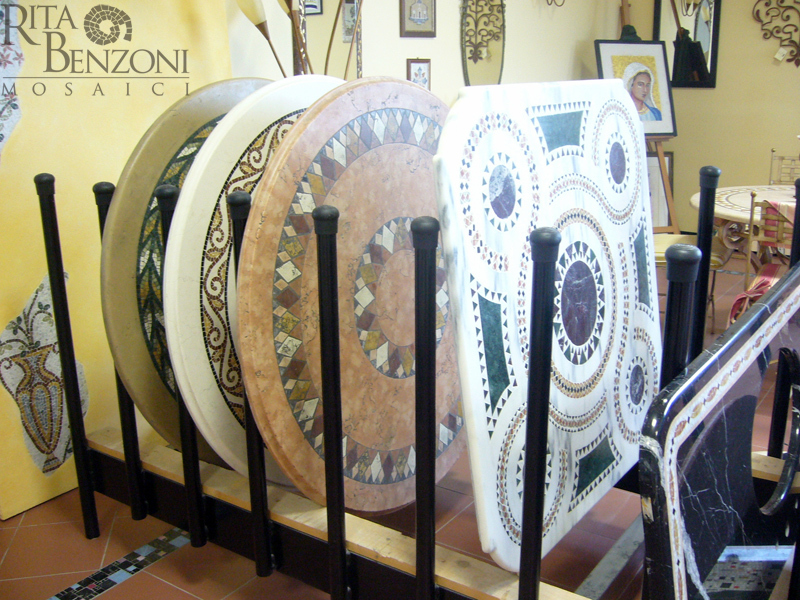 So coming to the last tesseras! 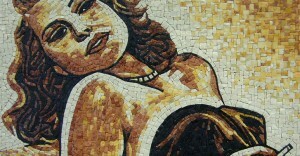 The mosaic on a provisional basis is finished! 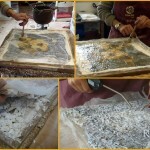 After drying lime with the mosaic,I dissolve the glue and lay good pasting over Charlie a canavas. 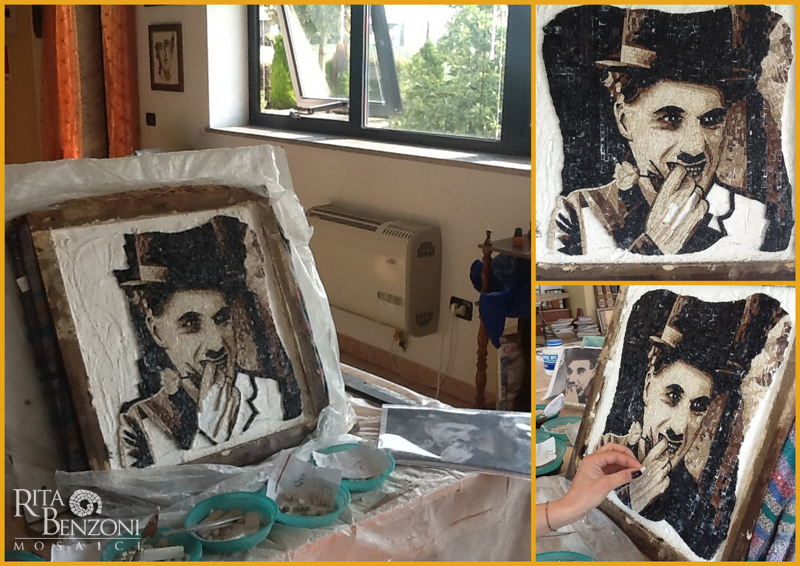 When the glue is dry then I proceed to rip Charlie from the frame by lifting the tesseras layer well glued to the canvas. 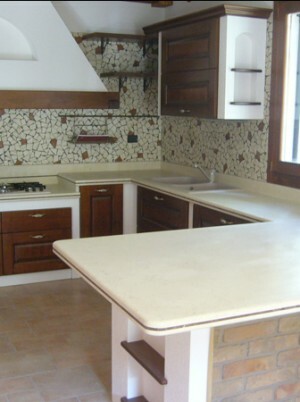 Dry lime crumbles easily and I get rid of it without problems. 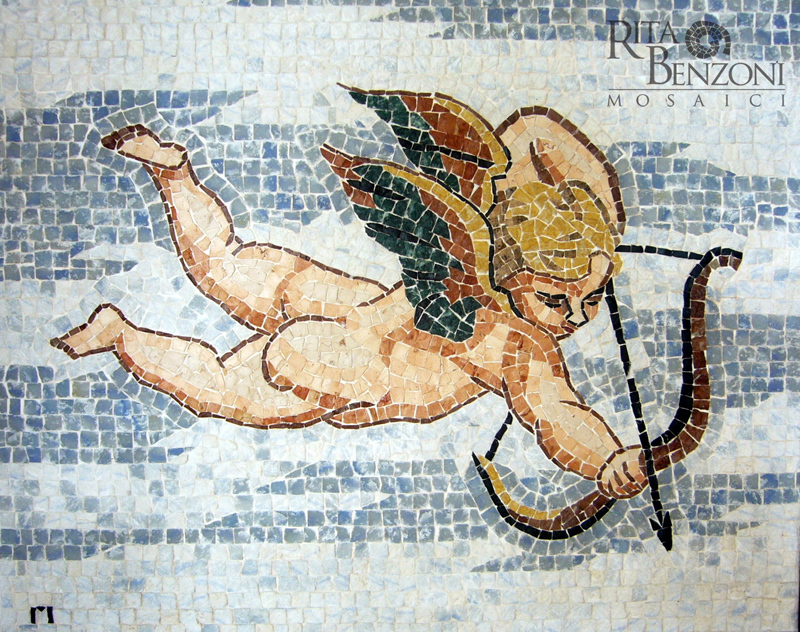 With the help of a metal tip and a small air compressor, I clear the back of the mosaic so the ultimate can adhere well between tesseras and tesseras. 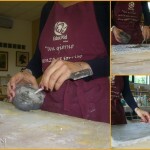 In a container I prepare the final cement glue. 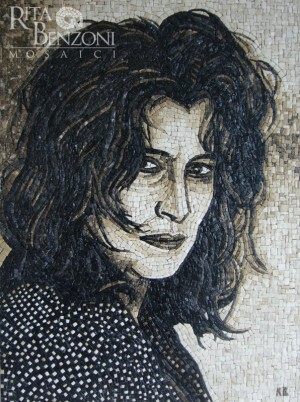 Just finished I let dry perfectly. 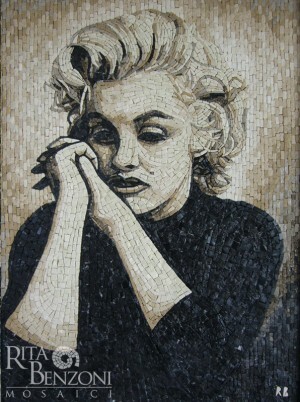 When the cement is harden, I moving to clean mosaic. 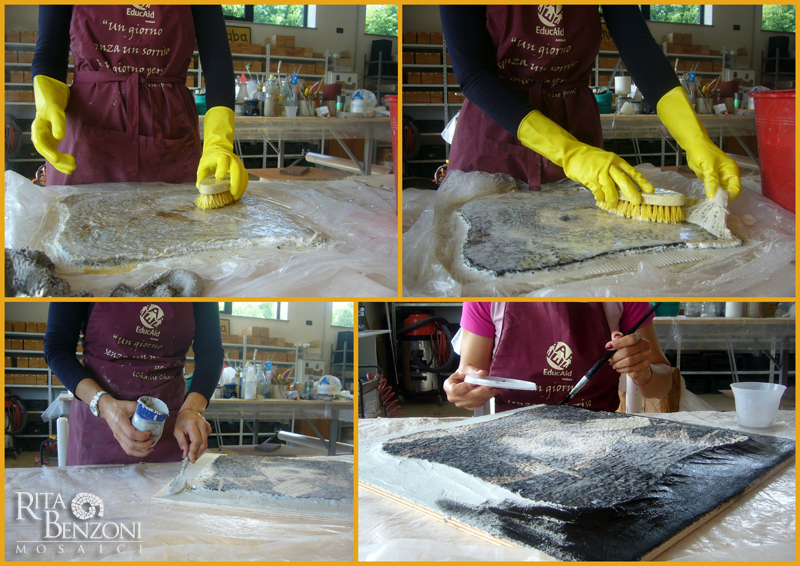 With hot water and brush, remove the glue and canvas. 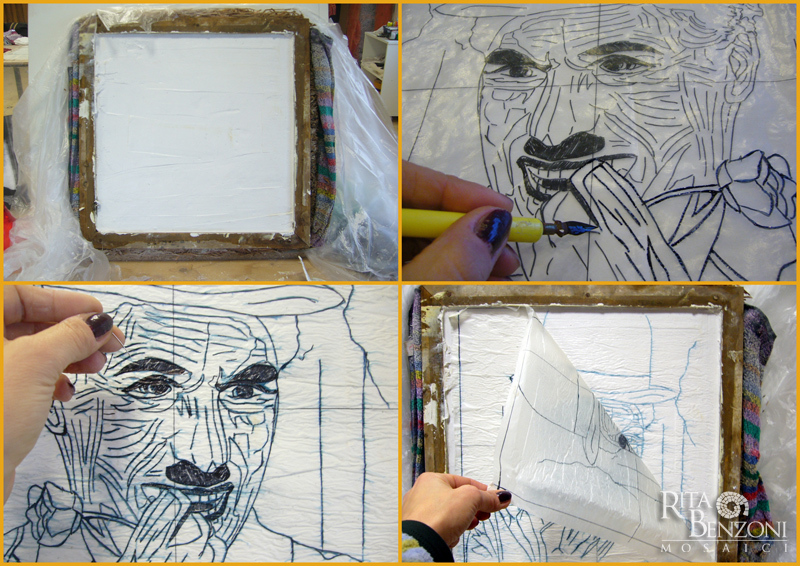 I paste Charlie on a wooden and I make a contour fund with cement. 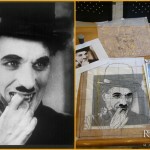 Then I paint the contour with acrylic color black to give a film old and worn effect. 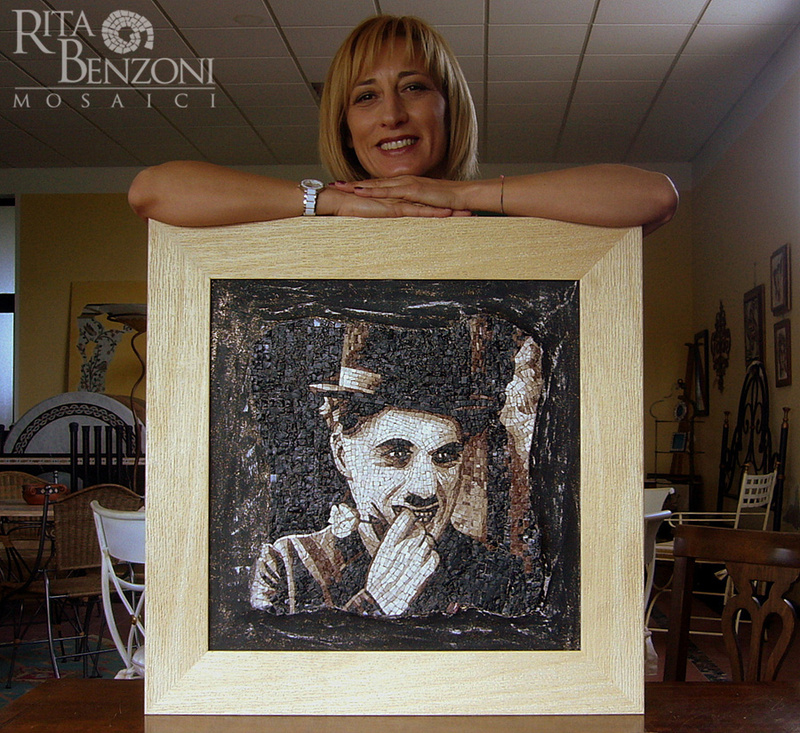 A cleaned up at all, a bit of wax to revive the marble and my work is almost finished, it lacks only the frame. 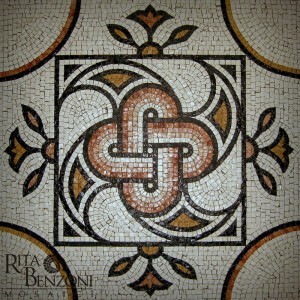 Thanks to those who have had the patience to follow me right here!!! 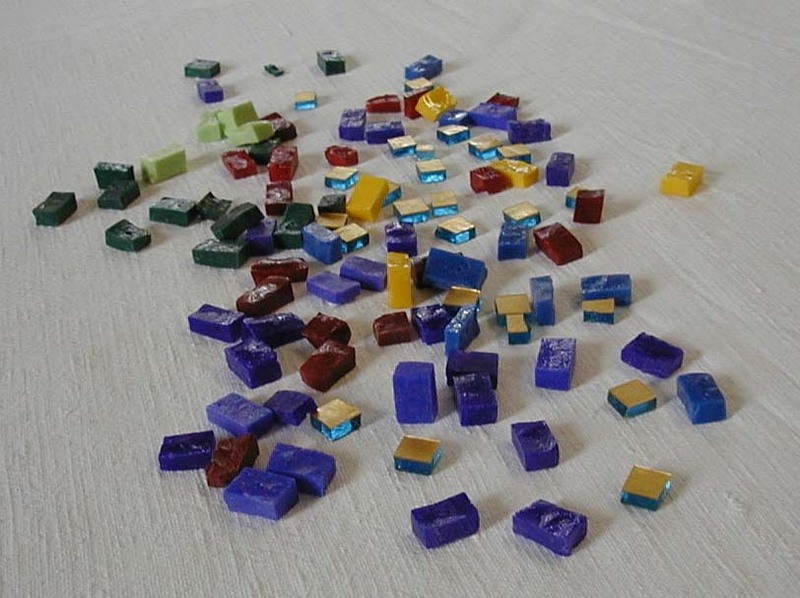 Vermiculatum (composed of tiny tesseras). 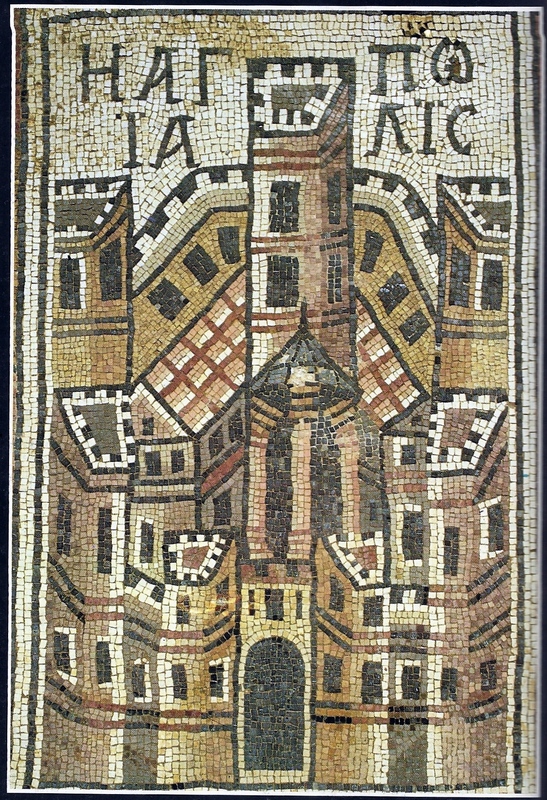 In the Third Century AD, the golden tesseras appear and in the Christian Age the vitreous paste wall mosaic assumes a style of independent art, arriving at its greatest splendor with the Byzanties. 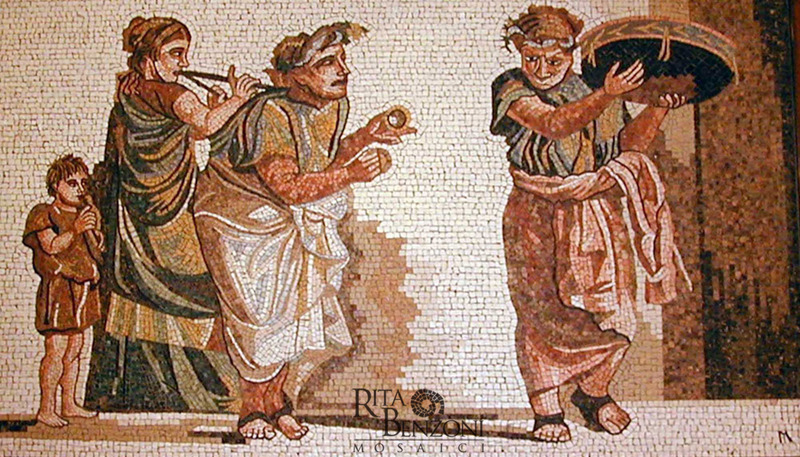 Thanks to the Romans, the figurative flooring mosaic reflourished and with the work of the Cosmateschis the inlay work prevailed. In the 17th Century tesseras assume almost the function that the brush-stroke has painting. 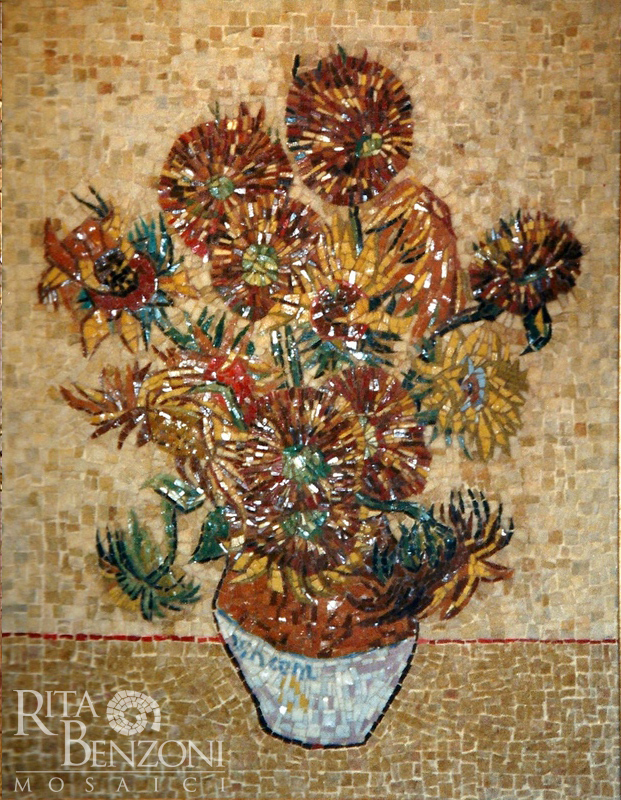 A more and more detailed technique had been evolving and it arrived at its extreme best in 18th Century’s works. 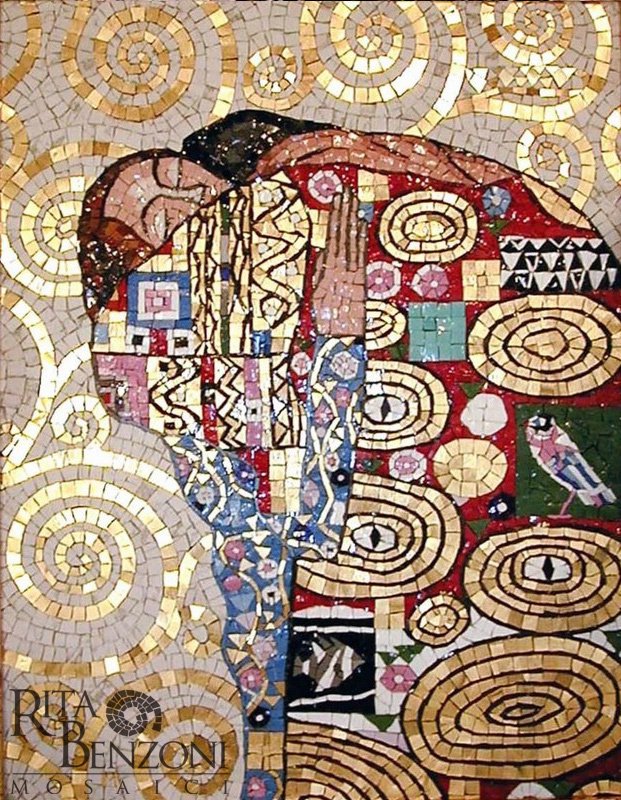 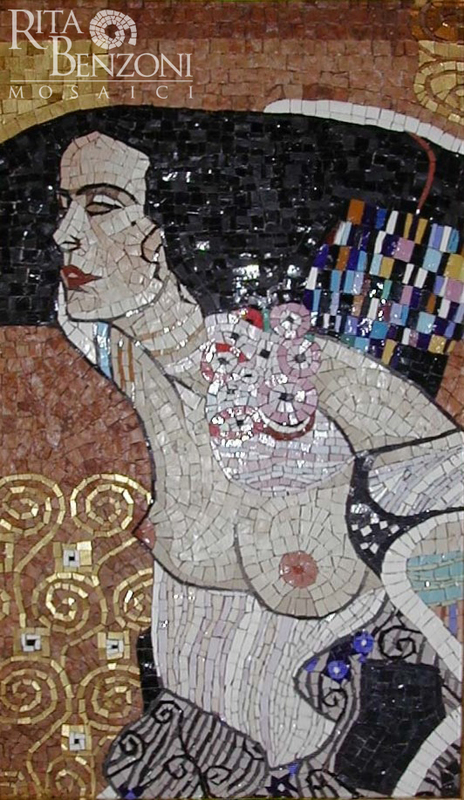 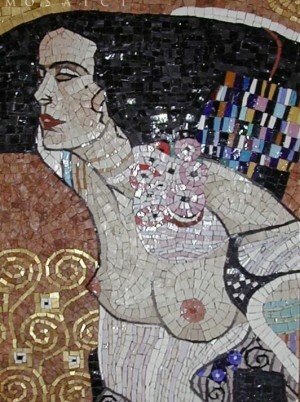 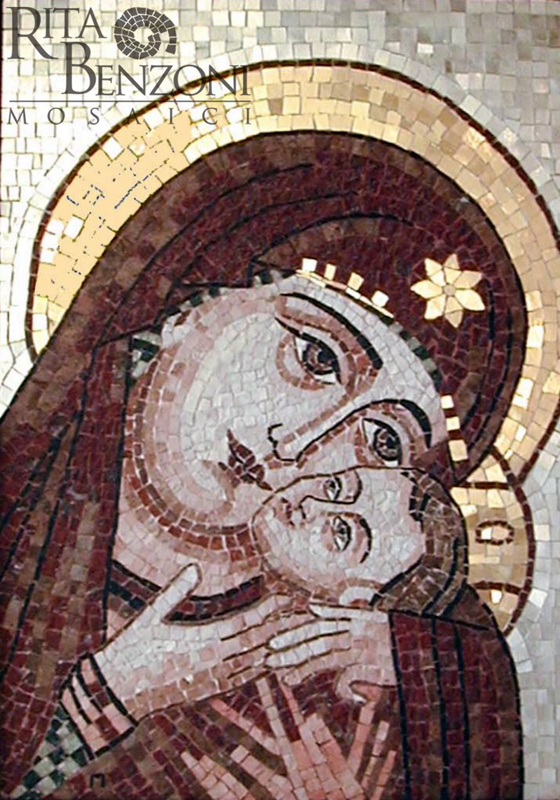 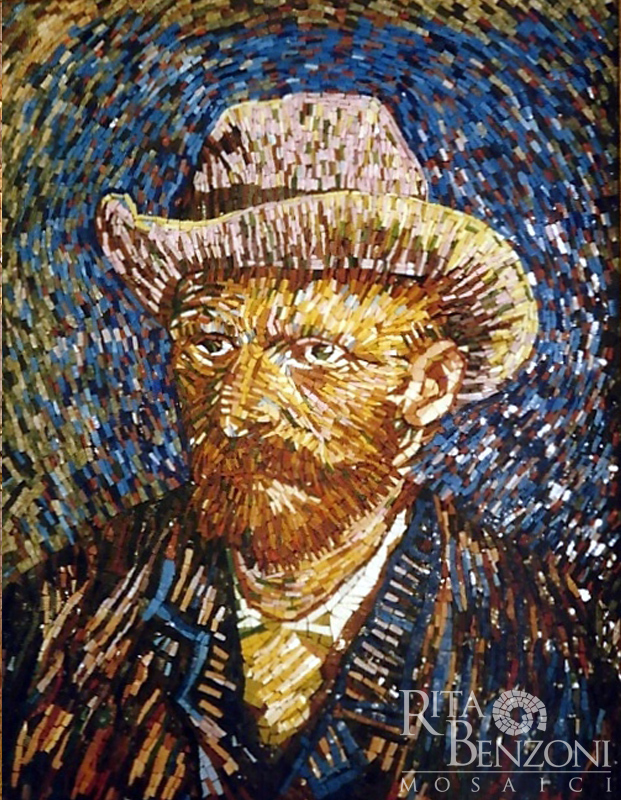 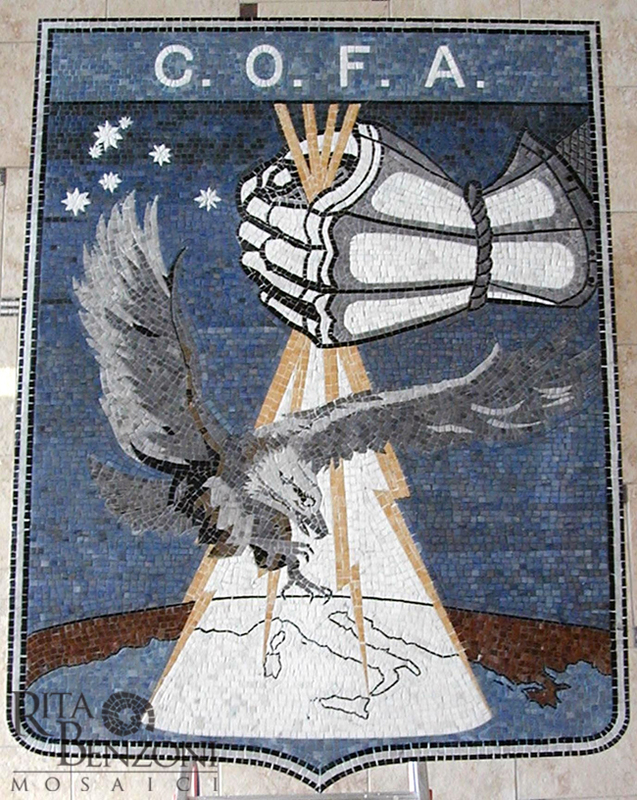 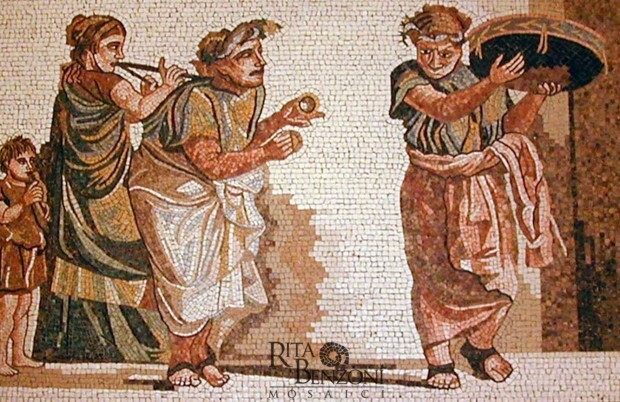 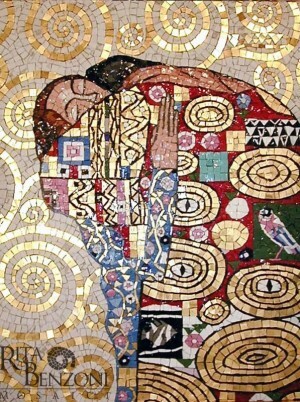 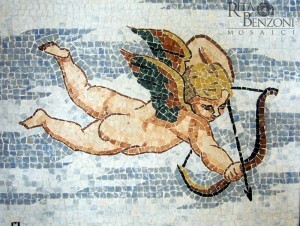 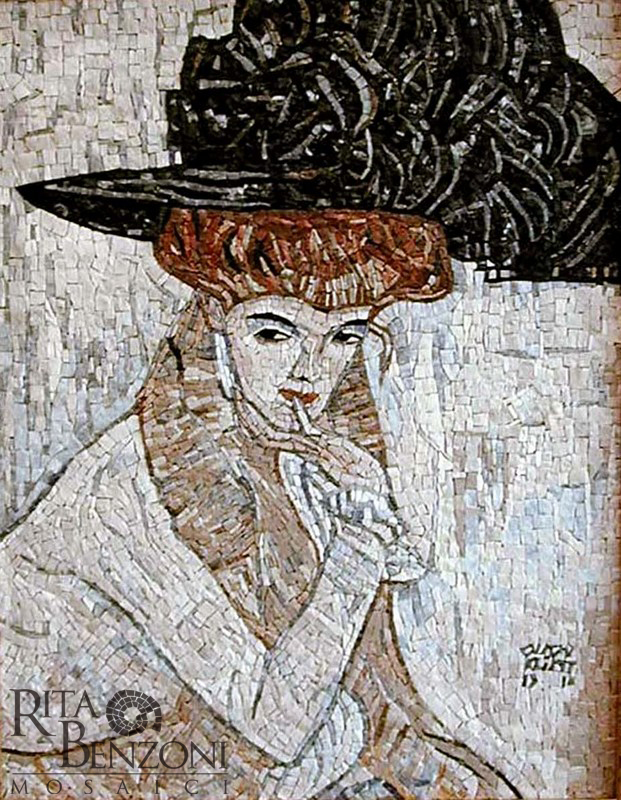 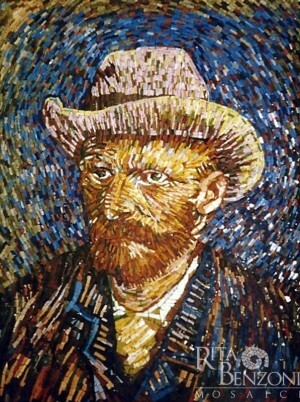 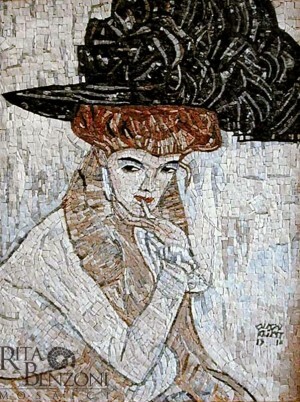 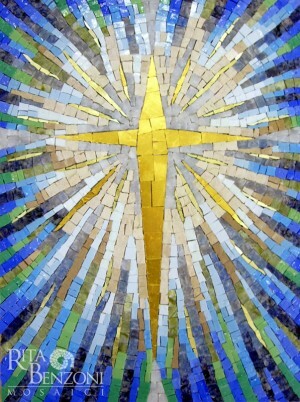 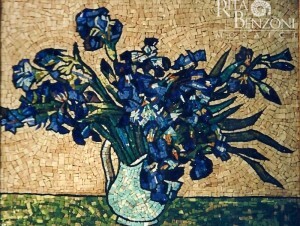 In the 19th Century the creation of mosaics on the one hand started using industrial techniques, while on the other hand it assumed a role of further integration with the painter’s work. 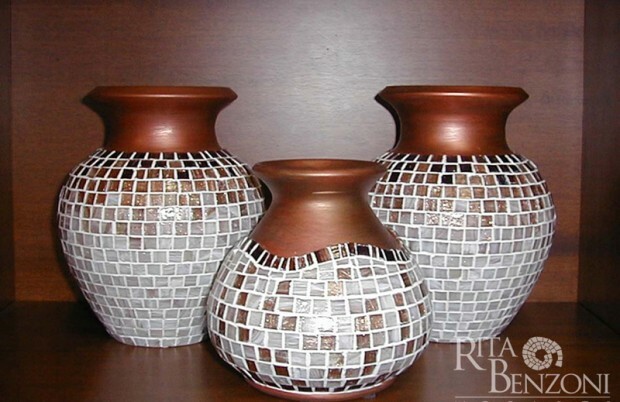 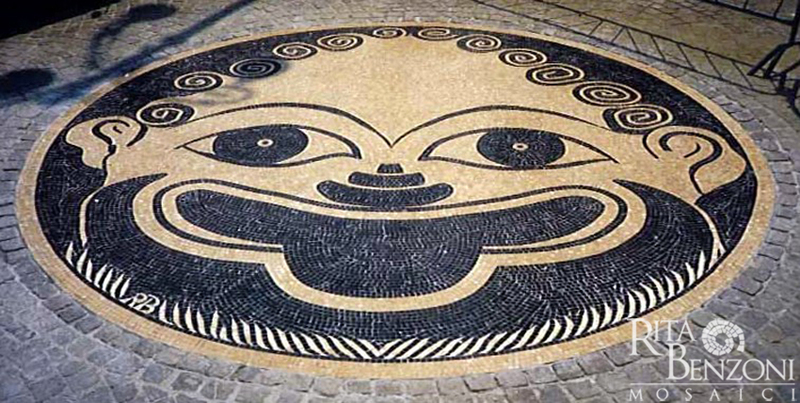 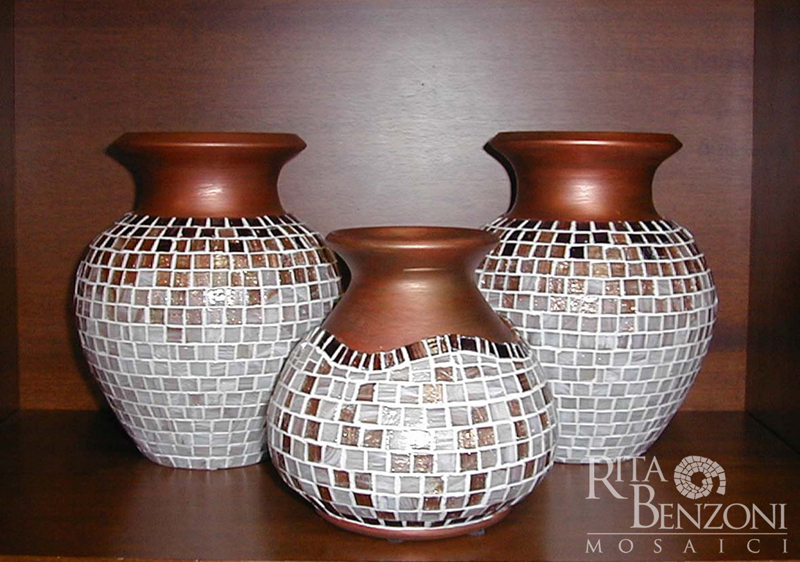 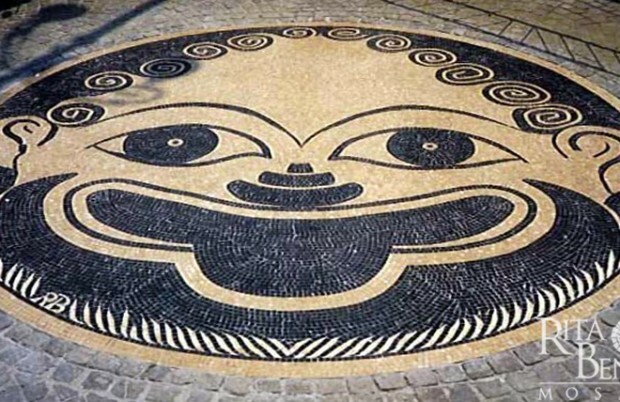 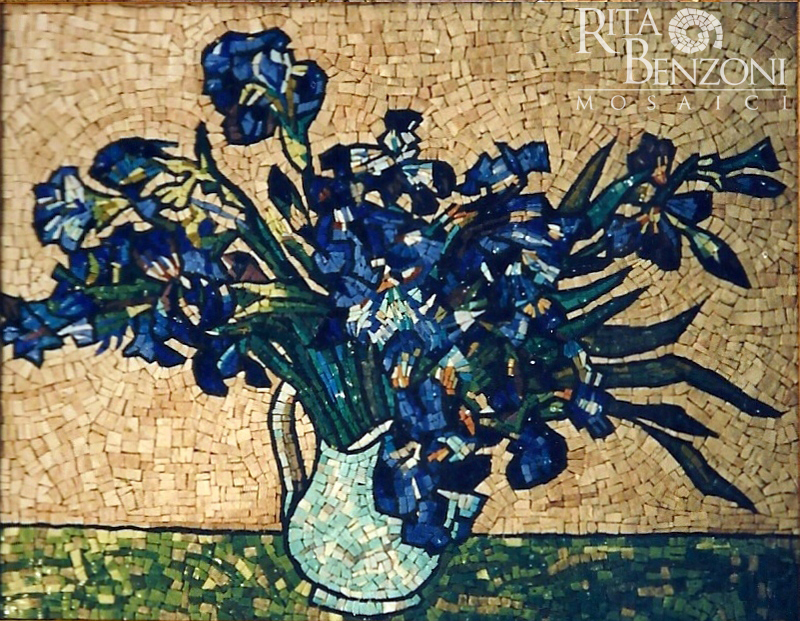 The mosaic, strongly represented as a traditional artistic craft, now is a medium that has been projected into the modern era and is treated in a similar way to the other recent artistic trends. 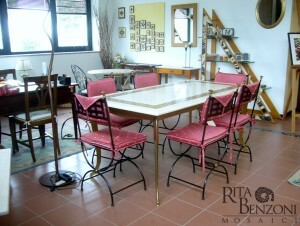 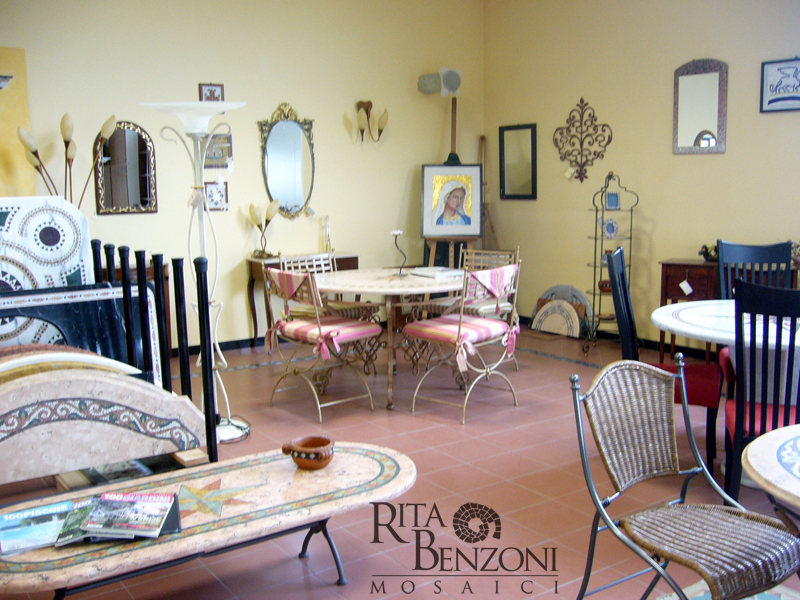 It’s here that fits my idea of artistic workshop where the mosaic art is a way of being, to live together different but extremly complementery elements among them. 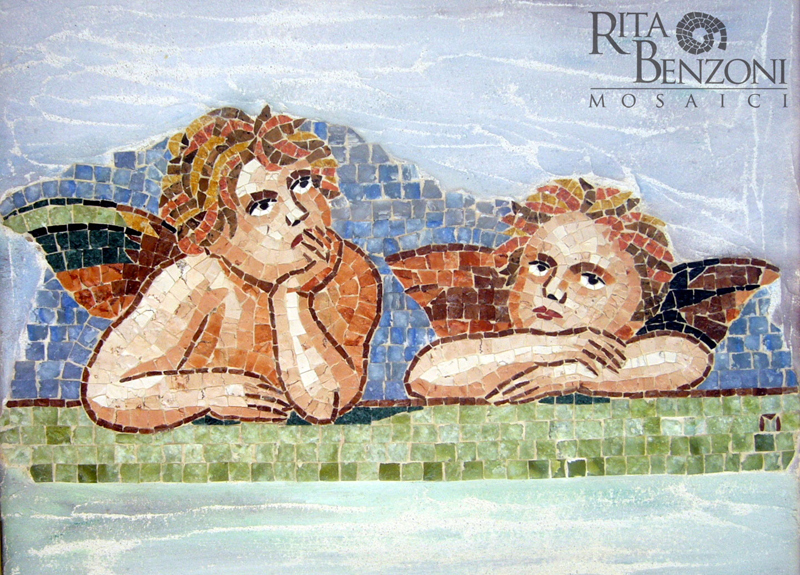 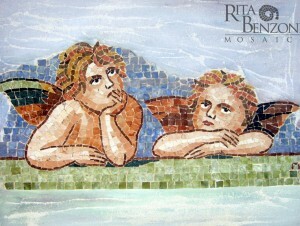 For years I have dedicated ourselves to learning the various antique mosaic techniques and so are able to reproduce or refine them to produce a more modernistic style. 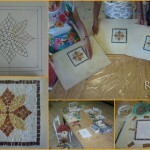 In my studios or in collaboration with architects or designers I can create to suit a customers personal requirements interior or exterior floor or wall mosaics, greeks frets, entrance o room centre rosette, modern decorative panels and reproductions of antiques works,artistic mosaics and sacred art, interio architecture with marble and urban furniture works. 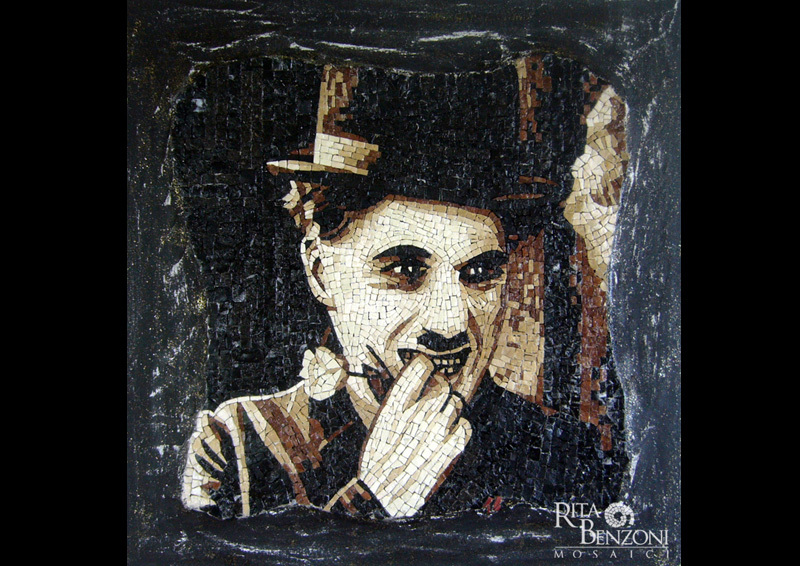 All my creations are crafted using valuable materials such as marble, natural stones, vitreous paste and gold. 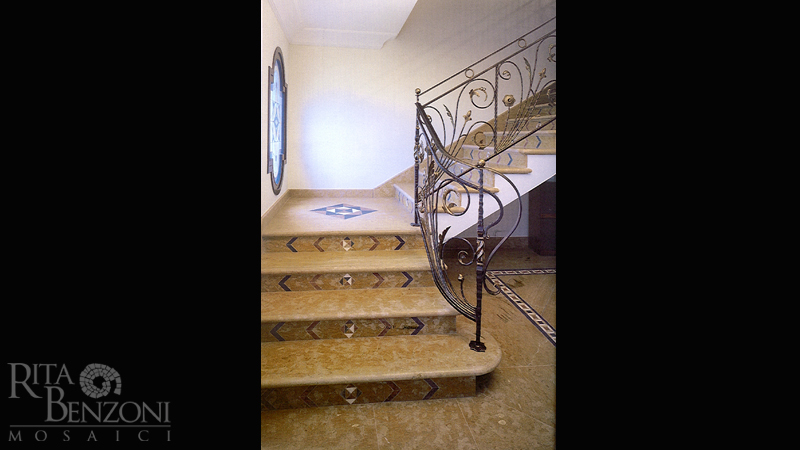 My other speciality is the insertion of marble inlays into wooden and wrought iron furniture. 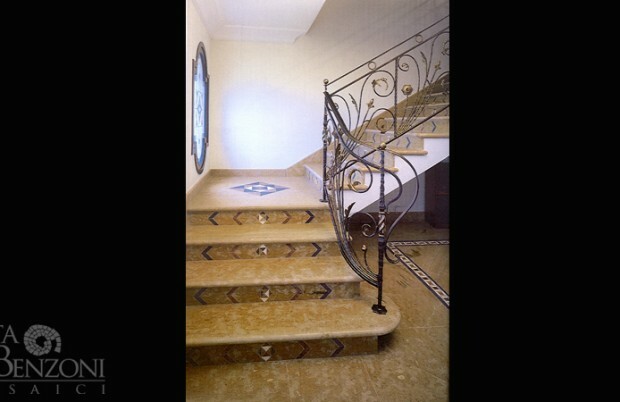 Dining and living room tables entrance, furniture and bookcases can all be given added elegance and uniqueness through these inlays. 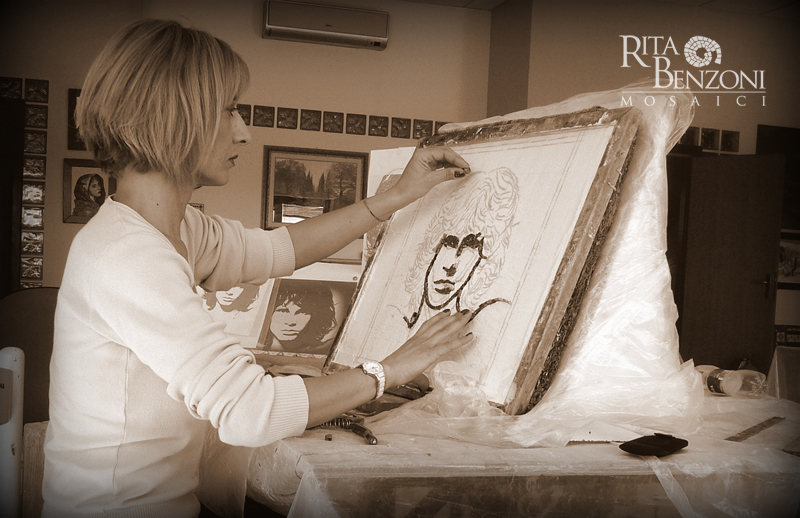 In my workshop I can professionally create a gift or personal furniture item to suit your needs and each will be an original and unique work of art. 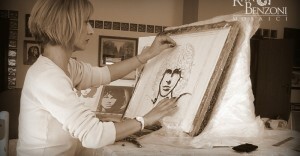 Now occupy a fundamental space in my career choices portraits. 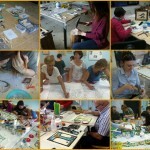 I organize basic and advanced courses for groups or individuals. 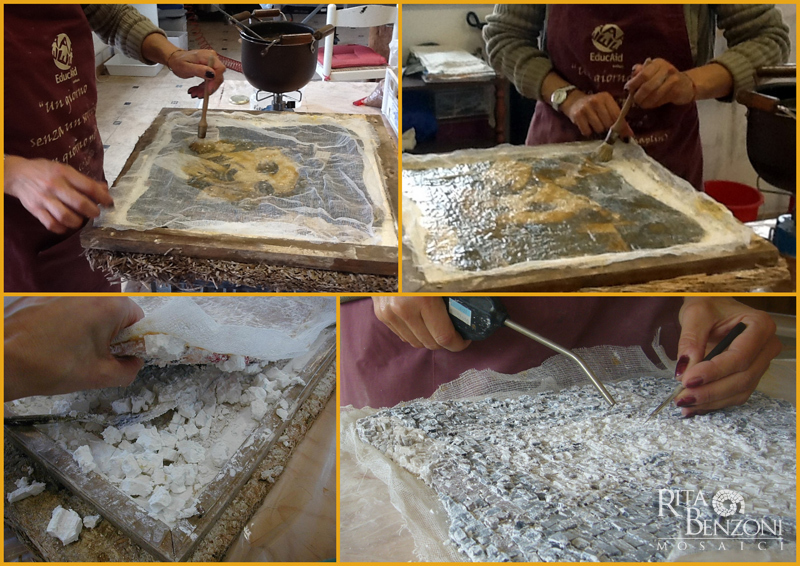 Courses can take place either in my laboratory and in other locations if required by specific educational projects.